TEAM Sanman, headed by its top brass, arrived in Los Angeles, California, USA on Saturday night (PH time) for the much-awaited fight of one its prized fighters Romero "Ruthless" Duno. Jim Claude "JC" Mananquil, chief executive officer of Sanman Promotions, and Dexter Tan, chief finance officer of Sanman, arrived in LA via PAL Flight PR 102. 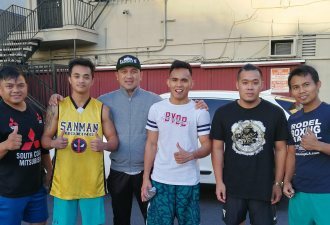 Together with Managquil and Tan was John Vincent Moralde, who is set to face American boxer Ismael Muwendo in the undercard of Jonas Sultan-Jerwin Ancajas fight on May 26 in Save Mart Center in Fresno, California. The 22-year-old Duno will be battling Mexico's Gilberto Gonzales (26W-4L-0D, 22KOs) on May 17 at the Fantasy Springs Resort in California in Indio, California. Duno (16W-1L-0D, 14KOs) is gunning for an eighth straight win that will brighten his chances of earning a shot at a world title belt. Duno has been on a tear since his magnificent US debut that saw him demolish erstwhile unbeaten Christian Gonzales via a second-round knockout in March last year. For his upcoming fight, the Sanman top honchos are confident that Duno will deliver the goods. "Duno is in top shape. He will be 100 percent ready for the big fight on Thursday," said Tan. Manangquil said Duno has been doing well in his training at the Wildcard Gym under the supervision of Rodel Mayol. "Mayol has done a great job preparing Duno. He is currently four pounds over the weight limit but all is good and we are on track," said Manangquil. As for Moralde, arriving in the US 12 days before his fight will serve him well, said Mananquil. "He will have the chance to acclimatize with the weather. He will train at Wildcard and will probably do two light sparring sessions," said Manangquil. Moralde is looking to get back on track after he lost to Toka Kahn Clary last Dec. 1, 2017. Moralde sports a 19W-1L-0D, 10KOs record, while Muwendo has yet to lose in 19 fights, including 12 knockout victories. Photo: Team Sanman outside Wild card gym in Los Angeles.